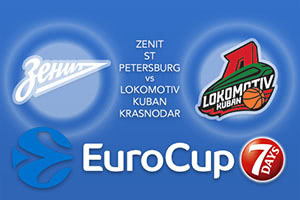 This is an all-Russian affair and it is sure to be a big game in St Petersburg on Friday night. The hosts know that they have to win to keep their EuroCup hopes alive. Both teams know that there was a big distance between the two teams earlier in the week but that doesn’t mean anything, this is a brand new game and Zenit will believe they have it in them to cause a shock and take this tie to the third game. A 23 points win indicates that there was a large gulf between these teams but this doesn’t mean that the same thing will happen again on Friday night. However, it needs to be pointed out that there is a level of consistency being shown by Lokomotiv. The fact that Zenit only grabbed 52 points in the game means that Zenit have kept their opponents below 68 points for six games in a row. If the away side can stretch that run out to another game there is a very good chance that this contest will come to a close before the weekend gets into action. One player that Zenit need to stand up on Friday is Sergey Karasev and the player has an average of 12.1 points per game so far this season. There has also been support from Kyle Landry who has provided an average of 10.3 points per game so the hosts have players who can score, but it will be a tall order to take control of the tie. Lokomotiv know that if they play to their strengths, they are in with a great chance of avoiding a third game in this series. The bookies believe that Zenit will square the game and take us to a third and final clash in Krasnodar but why not take Lokomotiv Kuban Krasnodar at +4, which is available at odds of 1.90. For the Over/Under market, choose to go UNDER 159.5 which you can find at odds of 1.90. Bet Now!